I’ll place a sizable wager that they double down on Stupid. The pols will call for extraordinary expenditures to build massive fields of windmills and solar. And then the wind will fail. Again. With pollies and government regulators making self-serving, misleading and outright false statements like this in the MSM without any push-back, any amount of factual information is clearly of no value in determining pubic opinion. Maybe street protests in Melbourne by a few hundred thousand ‘yellow vests’ would be more effective? I still think all this nonsense about renewables and carbon “pollution” is an excellent example of the Madness of Crowds in action. One day a lot of people are going to shake their heads and wake up to reality. Maybe they will then turn on the politicians and fellow travelers who led them down this dark path to miserable poverty. Exactly as predicetd by most Engineers and people with an iota of common sense. Turning over decisions about how to power a modern power grid to people who hate modern power grids, who do not think rationally, who hate industry, and who have never actually done serious work is madness. Yet the climate consensus opinion leaders are exactly that. And those they influence, politicians, media, and academics, have blindly bought in. This is “Atlas Shrugged” played out in reality. Souh Australia had roughly 30,000 without electricity. Apparently some transformers blew fuses because of the heat. I have bee unable to find the peak demand but a figure of 3,000 MW was quoted. Back in the Dark Ages (or should that be Light Ages) before renewables and with the 2 coal fired power stations since dynamited the State handled peaks of 3200MW. Since then nearly a third of homes have solar panels which should have reduced demand (except the panels are quite inefficient at 45℃). We’ve lost lots of companies shutting down or relocating, so why the blackout? Peak Demand in SA was 2954MW, well below previous peaks. Wind AND solar were supplying 303MW out of an installed capacity of 1929MW (15.7% 0f nominal capacity). 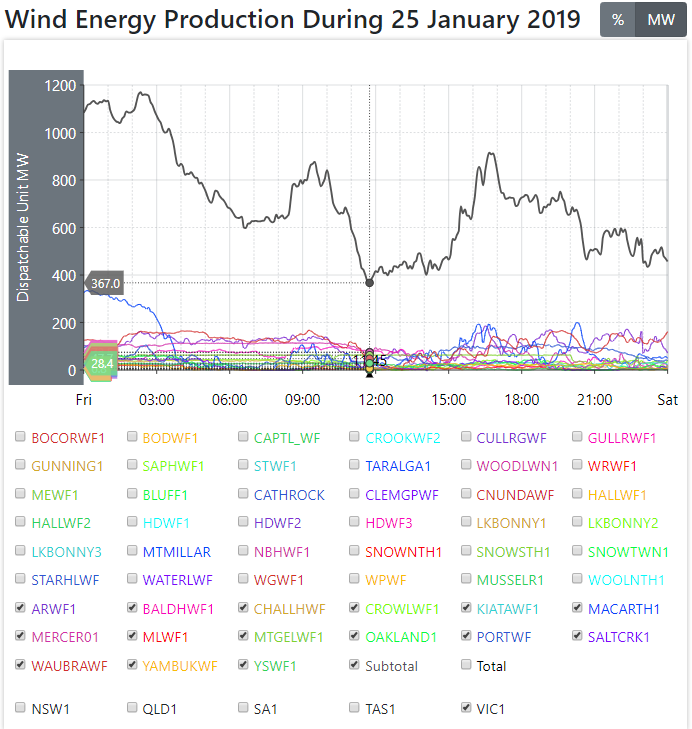 Victoria demand peaked at 9221MW of which renewables supplied 595MW. Wind turbine capacity 1740MW but solar PV capacity not stated.